I remember a couple of articles that appeared several years ago where a fellow did some bacterial assays on saltwater aquariums for his university studies and discovered that Nitrosomonas and Nitrobacter were almost completely absent. He furthermore remarked that the only studies that counted Nitrosomonas and Nitrobacter bacteria were from terrestrial assays done back in the 1950s. I was sure I saw these articles in Freshwater and Marine Aquarium magazine ~1996 but darned if I can find them again. I have reviewed FAMA from 1995 to 2001 but nada. I just knew that a regular contributor to FAMA in the 1990s like you would be the best person to ask. You da man, Bob! Thx very much for your prompt reply. [Thx for being patient with me. After several hours rummaging through my piles of old aquarium magazines, plus some very useful tips from Bob Fenner, I discovered that the articles I was vaguely remembering were in Aquarium Fish Magazine, not Freshwater and Marine Aquarium Magazine as I had originally stated (my bad). The articles started in the AFM December 1996 issue (Volume 8, Number 12) and continued in the January 1997 issue (Volume 9, Issue 1). They were written by Dr. Tim Hovanec � yes, that's right, the same man behind Instant Oceans Bio-Spira and of Dr. Times products. The parallel academic studies that he published during the same period are available on-line at the Dr. Times web site. The Dec �96 AFM article is where he notes that the original Nitrosomonas and Nitrobacter references come from terrestrial soil samples from the 1950s. What originally struck me in Dr. Hovanec's articles at the time is how they did a complete 180° on my understanding of the bacteria involved. I also noted that no-one was declaring Nitrosomonas or Nitrobacter to be the bacteria of note anymore in hobbyist publications since his articles were published. Yes, his effect was that decisive on the hobby literature. Now when I see someone starting to re-start the old Nitrosomonas/Nitrobacter claim again I felt compelled to bring Dr. Hovanec's findings back to the fore. Thx again for your help in all this kerfuffle. How do I go about recommending that your title be recognized as "St. Fenner"? First off, I can't be more grateful that I found your site. Your work is so appreciated! Anyway, I purchased some live nitrifying bacteria from Fosters' and Smith. I got to wondering, if these bacteria are live, wouldn't the change in temperature from Wisconsin to it's final destination cause the bacteria freeze and die when they get to a warm house? The info on all of the products say they don't need to be refrigerated, but it disturbs me. I just did a 30 gal in H2O change in my 125, and wanted to add some healthy bacteria after stirring things up. It was recommended for algae issues. Forgive me if I am redundant, but I couldn't find this on your site. Again, thanks so much for all of your help. You guys are the greatest!! Jo Anne on the coast of Maine (in the middle of a blizzard). The generator is not working, and I am freaked out about my buddies! all the LR and live sand was dry or "dead". 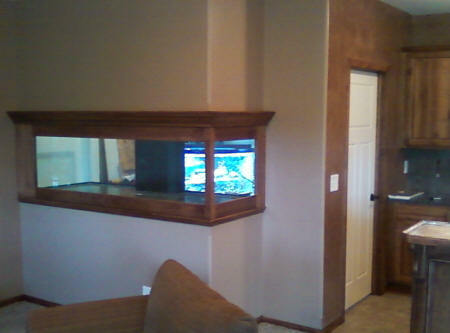 My plan has been to add on a 75 gallon refugium next to the display and just plumb it up from sump and overflow back in. My question is if I use all dry Rock and sand again will it cause any kind of cycle to my system? I have another bottle of Dr. Tim's, should I just pop that in as well? Hopefully this will be as easy as I think. Thank you so much for the help. Hello Crew, Hope all is going well for all of you. I wanted to ask about a product I ran across on the web called the eco-bio stone. Are you familiar with it at all, and if so do you know if it is worth purchasing or not. Good afternoon crew. I am starting another 20 gallon marine tank and have a question about adding live bacteria. I currently have about 10 lbs. of live live rock and 25 lbs. of live sand. My LFS told me to add live bacteria to it and the tank would be ready to start adding in about 3-5 days. I have the bacteria, but wanted to get your opinion before using it. I don't want to add something to the tank that would throw the nitrogen cycle off balance. Also, I have my salinity at 1.018 just to make sure there weren't any parasites on my live rock. Is this going to make a difference in the cycling. Thank you for the reply. It was the idea of my LFS to keep the salinity low. Luckily it was at 1.018 for less than 24 hours and is now at 1.022. So hopefully there will be a minimal effect on my live rock. I was wondering when it would be safe to add fish. It has been cycling for about 48 hours, 24 of which were with bio Spira. I want a blue spot Jawfish as my first fish but I don't want to condemn this expensive beauty to an irresponsible death. My ammonia is 0, my Nitrite is 1.0 and dropping, and my nitrates are in between 0 and 10. How much longer should I wait before adding the Jawfish? Thank you all again so much, I really appreciate all the help you give, and so do Many others.